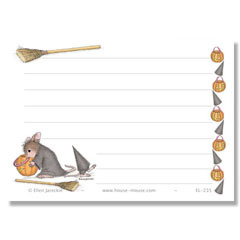 Our "tiny as a mouse" magnetic errand listers are perfect when "just a little list" is needed. Each pad is printed on our smooth, cream-colored recycled paper. Fifty sheets per pad. One of Amanda’s favorite products! Size: 3 1/2" x 2 1/2"! Price per "Errand" Lister: $2.99 each / Buy any 4 for only $2.50 each! Buy any 4 for only $2.50 each!